In fact the people that have pre-ordered or are considering pre-ordering the Batch 2 KnCMiner Titan Scrypt ASIC miners might have more luck and get faster ROI time as their units that are supposed to start shipping sometime next month will be upped to 400 MHS hashrate and cost $6995 USD without VAT. Even though these miners at that price are also not so attractive in the current market situation, so the interest in them will probably not be that high now, especially when the competition is also preparing interesting and more affordable products with higher hashrate and lower power usage. But back to Batch 1 miners, these 300 MHS Scrypt ASICs will be broken down to 4 separate cubes using the design that the company’s 3 THS Neptune Bitcoin ASCI miners relied upon and will have a total power consumption rated at 1160 watts. This also means that each of the cubes will use almost 300 watts of power, so hopefully KnC will equip these with two PCI-E power connectors instead of just one like on the Neptunes. 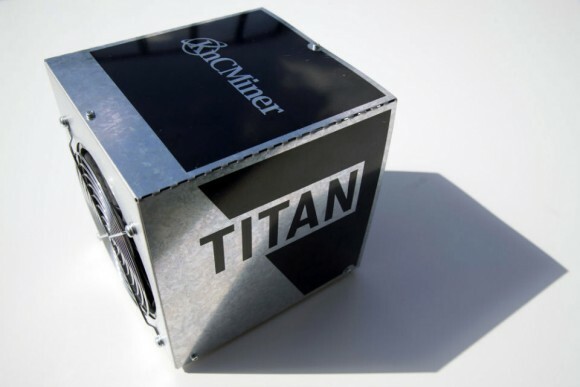 The announcement from KnCMiner that they are ready to start shipping the Titans did contain something interesting as well, namely the following “The Titan was designed for several variants of the Scrypt algorithm, including Scrypt-N”. This suggests that the Titan will also be capable of mining Scrypt-N coins at a lower hashrate than that available for Scrypt-based crypto coins. KnCMiner has released an update regarding their upcoming Titan Scrypt ASIC miners, according to the manufacturer they are already finishing the first run in fabrication of the chips this weekend with wafers being sent to the next step: encapsulation. After that the finished chips will be sent to Stockholm, Sweden, where they’ll move into the testing and assembly phase, and then the finished miners will be prepared for delivery. The company has also announced that the Titan chip will use a PCB (board) with the same physical dimensions and footprint as the ones used by the Neptune SHA256 ASIC miners, while requiring substantially lower wattage as well as the same new modular design system for the miner itself. So it seems that KnCMiner will be able to meet the Q3 delivery schedule for the Titan Scrypt ASIC miners, with the company probably starting to ship the devices sometime in September. That however does not come as so good news for the people that have pre-ordered the miners early expecting to be able to make a quick ROI and get some nice profit. With the current Litecoin network difficulty that continues to increase all the time and the not so good market price for the LTC at the moment even getting a return of the initial investment seems like a hard to achieve goal, let along to make some profit. That is of course if the market conditions continue to be unfavorable for the Scrypt ASIC miners – increasing difficulty and declining price of LTC. The fact that we are still probably a month away from the Titans starting to get into the hands of miners along with the fact that other ASIC manufacturers also expect to have products ready for delivery by that time does not make things seem so bright for the customers expecting their Titans.